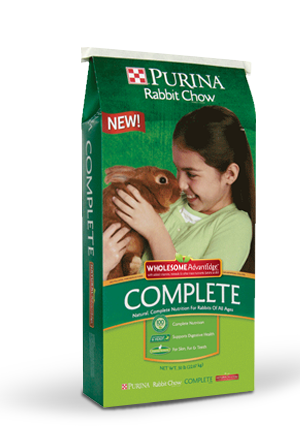 Purina Rabbit Chow Complete Wholesome AdvantEdge is a pelleted, highly palatable food essential nutrients for growth, maintenance and reproduction. It has the right balance of protein, fiber and critical nutrients, making it an excellent food for all types of rabbits of all ages. It’s an easy way to feed and a great choice for first-time rabbit owners.